The Fashion Weeks recently ended. Some brands inspired me little bit, but most of them, were, in my opinion, disappointing. For example - Versace. Whether you have been invited into the front row (congratulations), or you checked photos of the ss 2016 collections in the magazines, or you saw all the fashion shows on Youtube, like me, you noticed, that next summer the trend will be metallic outits, like this one. And not just for the party. In line with this forecast also came Maison Martin Margiela, YSL, Giorgio Armani and even the big Louis Vuitton. Fortunately, now there is a proper trend for 2016 supported by all the big brands and this situation relaxes me very much as I thought I had to preserve half of my wardrobe. 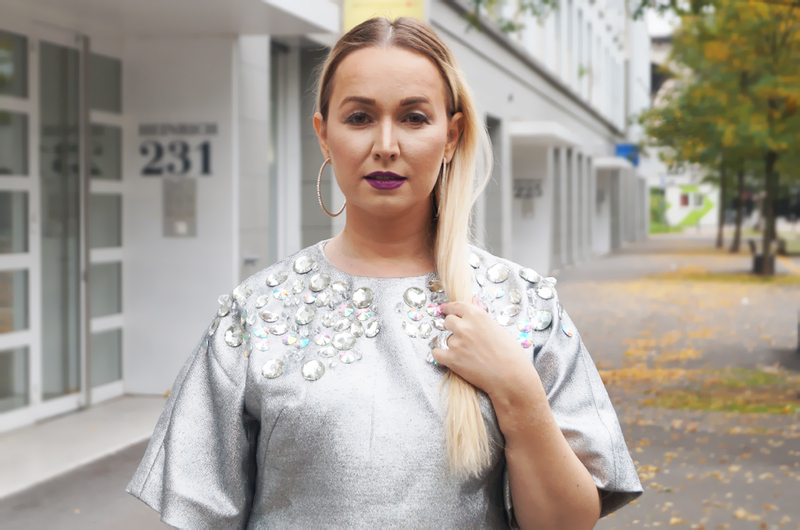 To adapt this clear path and to give you a hint for next year´s possible looks, I decided to take pictures of my personal interpretation in a metallic outfit. Even it was very cold last Sunday in Zurich, I hope you can see that I had a fun time doing those pictures. I enjoyed playing with a bubble blower and I did not care what passersbys think of the scene. Inside of me I had a beautiful flashback of when I was seven years old. The dress is from the collection of Asos Black, the holographic shoes are from Missguided, the bracelets from the brand SYL and the ring is from Swarovski. What impressed you from the ss 2016 collection the most? Všetky fashion weeky práve skončili. Niktoré značky ma potešili, ale aj to len trochu a niektoré sklamali na celej čiare. Napríklad Versace. Či už ste boli pozvané do front row (blahoželám), alebo pozreli fotky kolekcií ss 2016 v časopise alebo ste videli všetky prehliadky na Youtube tak ako ja, mohli ste si všimnúť, že budúce leto sa budú nosiť metalické outity, ako je tento. A to nielen na párty. S týmto nápadom prišiel Maison Martin Margiela, YSL, Giorgio Armani a dokonca aj veľký Louis Vuitton. Dosť ma to ukľudnilo, lebo som sa obávala, že budem musieť vyhodiť polovicu šatníka. V snahe byť in a aspoň z diaľky sa podobať zvučným menám, rozhodla som sa nafotiť metalický outfit. V Zurichu bola strašná zima, ale ako si môžete všimnúť, aj tak som sa počas fotenia veľmi bavila. Mala som so sebou bublifuk a bolo mi bublifuk, čo si o mne okoloidúci mysleli. Naposledy som sa takto bavila asi keď mi bolo sedem. 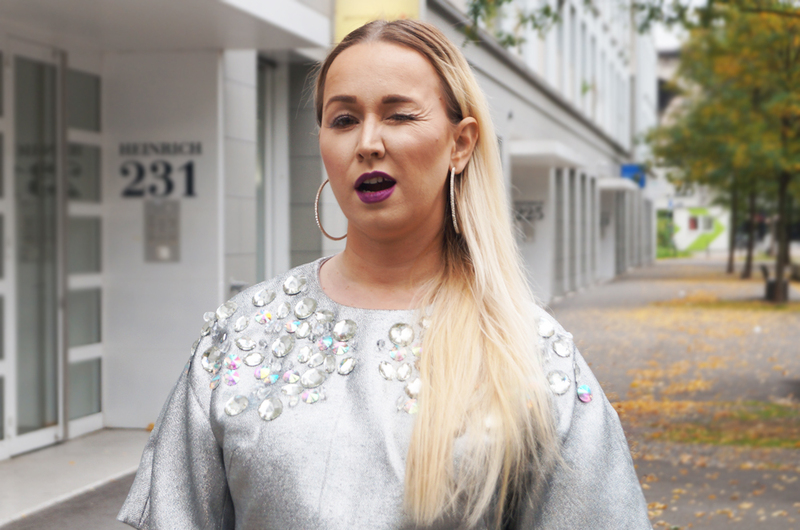 Šaty sú z kolekcie Asos Black, holografické topánky z Missguided, náramky značky SYL a prsteň Je od Swarovského. Ktorá módna prehliadka pre jar a leto 2016 vás očarila najviac? Milujem metalické veci, sú také živé, odvážne, sú proste parádne. Outfit od hlavy až po špičky dokonalý ako obvykle. You looked great! I like metallic outfits a lot, but in your post I like the fluffy jacket even more as I've been looking for a similar one since ages! So cool! Lidi už mi jsou také celkem jedno. Vždyť jim neubližuji, tak proč jsou takoví? Moc se mi outfit líbí a to psaníčko, krása. amazing blog!!! You looked great! wooow! 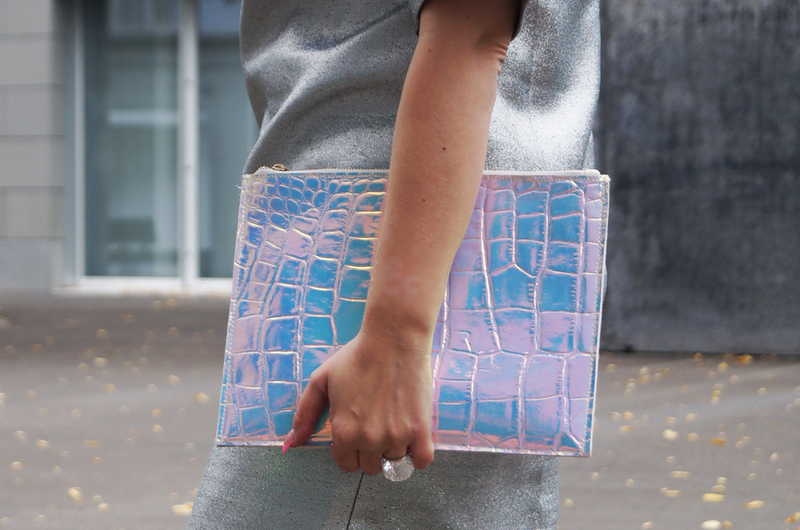 this dress is from space! Veľmi ti to sekne :) A tie topánky sú božské. Awesome Outfit! Kisses from Germany. Beautiful! I like the lipstick, dress, clutch, nails, coat and everything! So fashionable! Great look, so stylish and unique! I love the dress, it's beautiful! Nice outfit, love the grey dress. Awesome dress! And I also love your shoes! I looove your hair, so long and that color! You look gorgeous as always! I liked Longchamp Paris RTW Spring 2016 fashion. The shoes!!! I´m totally in love with them!!! Beautiful dress !You are gorgeus ! The shoes are so great, they really match with the dress.